valentine's day was meant for love and happiness and sharing. i did just that. i sent all my favourite people handmade valentine cards. my family. my close friends. with a teeny homemade poem on the front. it made them all smile so that plan worked. and ofcourse i did not expect a thing this year. the first year since he went far away to nowhere, i was nervous slightly. but i got over that feeling very quickly. i was happy that this day was all about having fun with my girly faeries. but look. what is that sitting on the welcome mat amongst the bills? a cream coloured envelope addressed to... me?! oh. it was from mr. questionmark. i was giggly and nervous and gushing. and the butterflies swished all around me. thank you mr. questionmark. *on that early saturday morning, i went to the magical place of boxes. boxes full of things that you could imagine being sat beautifully in someone's house in the sixties. i found the most beautiful vintage teacup and saucer and teeny plate. floral and gold sparkly and just perfect. all for very little pence. it was lovely. i also bought some beautifully vintage looking floral wallpaper. i hope mother lets me put it up in my newly decorated room at easter. i travelled to the magical bookshop afterward. the man greeted me with a lovely saturday morning smile. i ran up the stairs to the children's section. and i sat there reading for a teeny bit, contemplating which books to get, as very little pennies. i then had a teeny browse in the other sections. i bought some poems too. oops i have more chocolate mice and piglets and other teeny delights. i should stop. but i am such a sweet tooth which seems to appear unfortunate sometimes. they love to be eaten though. they do. they do. especially with cups of tea. im pretty sure i start each and every comment with that , because that's how i feel everytime i read your blog ! you're like a sugary pink pixie whose words sound like sunshine and old books . My sweet tooth will do me in someday, but brisk walks even it out for now ;) For Valentine's day I made pink macarons with bitter chocolate filling - they are deadly. Yum. Your new teacup is beautiful! I hope to find a new one soon; but they are so expensive here and we have few of those delightful shops. But there is a lovely little used book store called "House of Prose." mr. questionmark! I hope you find out soon, if you want to. Hee hee! You are very fortunate to have a secret admirer. I like your poem and pictures and the candy you eat looks good but a little tooth-hurty. i have those tea cups too! they are my favourite for tea parties. and thank you for the reply, means so much and makes me think that blogging truly is a positive idea :) thank you for that spark of a smile. You're blog always makes me hungry. Even today after i've just had a huge pancake breakfast. I was out of town for Valentine's day but close by to my grandmother's so i swung by and baked cupcakes and spent time with family. Oh and my mother surprised me with a new cellphone. So it was a wonderful Valentine's day for me. happy post-valentines day, sweet girl! such a delicate pretty post. the little teacup and saucer and pretty plate look just waiting for a tea party. and oh the candies and the tale of your adventure made me smile! 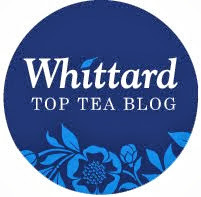 i do love your blog so much, tea drinking rose, dear. it is like a valentine every time. i wish i could come live in your world of wishes and petals. but it is enough that i can visit her. you are too too sweet for words. keep being pretty and sweet! I absolutely adore that little tea set! I almost brought a vintage floral tea set a few days ago, I wish I had!! and your valentine day card idea is lovely, very sweet! oh, darling you are so incredibly endearing! anyhow, happy happy valentine's day, dear! & to whoever your mister questionmark is... well... what a lucky lucky man. to have made YOU feel that way. how very sweet. i applaud him! whoever he may be! I do so wish I lived in England, for I have never had chocolate mice or piglets or other teeny delights. Tis oh so very sad. Your new floral sparkly teacup and saucer are just gorgeous, as are you my dear. Lovely teacups. I love browsing through the old bookshops, filled with an amazing atmosphere. Oh I have always meant to go there! I just have never managed it. The carboot sale at colwick on sundays is very very good for acquiring secret treasures too. The little path way with the black metal gates gets you to my house, if you keep walking. The Walk itself is a cafe that I think you would love, where my housemate works: http://thewalkcafe.co.uk it has old teapots and cakes of all kinds and champagne afternoon tea! Which I haven't had yet but hope to soon. Oh lovely! I so want a new teacup & saucer. I only have the one. Where do you find such beautiful ones? As part of my Valentine's present I got a rather cute teapot! I can't wait to use it. :D Tomorrow I'm going to buy milky bars & milky ways & drink earl grey! I also have a killer sweet tooth. Eat more sweeties, I say! Such a perfect way to spend Valentine's Day. All you need is cupcakes! Aren't you a sweet heart? I bet everyone who received your handmade valentine card was extremely delighted! Oooh, and what wonderful finds. The teacup and wallpaper matches! I imagine it would be so nice to sip tea from that cup, in a room covered in that wallpaper. *sigh* dreamy. I love the children's books section too. Yet I feel I'm too old (and shy) to spend any time there. What a lovely tea cup! I am quite envious, as I have been looking for such an adorable addition to my dish ware with no such luck. I myself have been munching chocolate to my heart's content due to the ridiculous amount I have acquired from the holiday. I love hearing about your magical bookshop. I have one I love too. Perhaps you could post pictures? I promise to do the same! I'm so happy to hear your saturday was so pleasant and perfect. I am a sweet tooth, too. In fact, I just had to brush my teeth to keep from nibbling on chocolates! that tea cup is adorable! Sounds like a perfectly sweet day. i never seem to be lucky with finding any teacups .. there all too plain! the sweets look yoummy to! That wallpaper just looks so delightful! You are so pretty! 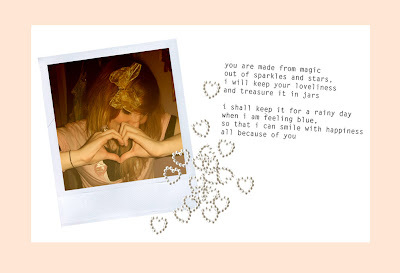 I am glad that Valentine's was full of lovely things and people...I've tagged you darling! Your blog is truely scrumptious! oh my god! you're so beautiful, i love love love your blog. and tilly-rose, it's so sweet, i can't find words for its. you always have the most whimsical and fun posts - I love pretty teacups and saucers - yours is so lovely! oh we had such a good day! the cattle market was so much fun. i still love your amazing finds! thank you for such a fun v day! I love how well this floral wallpaper matches your tea cup & plates :) By the way I nominated your blog as one of the top 10 fabulous blogs in my recent blog entry, just thought you'd like to know. that is too sweet about your valentine from mr. questionmark, i hope that all goes very well for you. the teacup and paper is lovely...sweet dreams and good luck with your mr. questionmark. Those sets of tea cup was so beautiful..
Hope to see you on mine too..
you card was ever so pereect!! and what a delight it was to recieve :) thank you ever so much!! your new tea cup and saucer is so pretty i cannot believe!!! how i wish for one, i do not have any teacups that come close in prettiness. and the wallpaper!!!!! ow wonderful that would look on my side of the room when we decorate :) yur room will look just perfect. i cant wait to see it when your done!! O my goodness, I LOVE the sweet little card that you made! your teacup is quite simply beautiful, how i wish i lived near a lovely little shop like the one you speak of, it sounds delightful. and mr.questionmark! how very very exciting! pink piggy sweets are my all time favourite. my father brought me some in a brightly coloured bag yesterday as we travelled home from disneyland, how sugary splendid they were! happy valentine's day! I love the card you made. wow that letter you got is so sweet. and the vintage plates and everything are amazing! glad to see you had a wonderful valentine's day. ths is lovely!!! hope your well!!!!! Wish I can fly somewhere there's only happiness can be found. Have a nice day Lottie. i love the tea cup and saucers. i am working on collecting a set of my own. What a gorgeous post sweety! I love the pretty floral things, precious wallpaper. I had such an awful valentines weekend, well half of it was. your posts always make me smile though. Aww i love your Blog its sooo cute, i have just made my own blog and hope it turns out to be as good as yours!